Saudi rules dictate that women should never get out of their houses without an abaya. A few days ago, I heard about how my dear friend’s sister, clad in a long abaya with a trail at the end, accidentally got her trail fabric caught in the escalator. With her abaya entangled in the moving escalator, my friend had to quickly rip the abaya just in time to save her sister from serious injuries! Some women purchase abayas with long trails of fabric at the back which make them look fashionable and trendy. Nevertheless, ladies should never forget that these designs pose serious risks and also tend to get dirtier when women walk on roads. 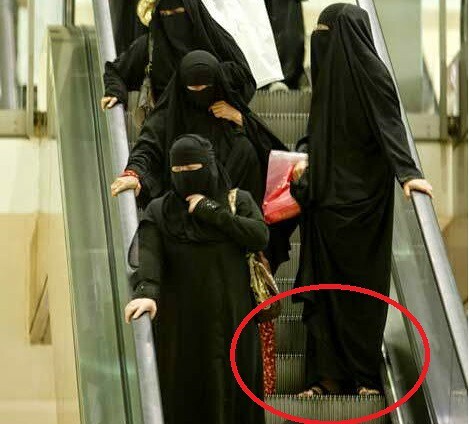 Long abayas with trails pose accidental risks on shopping mall escalators. Do you know that if you fall on a moving escalator, it can rip your face and damage your hands and feet seriously? You would certainly not want to pursue a fashion which comes at a heavy price of stitches and scars on your pretty face, flawless hands, and feet! You should be very careful about this particular thing while living in Saudi Arabia. What is the solution for women? After hearing my friend’s sister’s closely missed mishap with the mall escalator, I would advise women to have abayas custom made which are practical when it comes to length. Of course, they should not be short enough to show feet and legs, but they should neither have a trail at the back. After all, fashion is not just about dressing up according to the trends of today at the cost of one’s quality of life! Which design of abayas is trending these days, ladies? Share your abaya stories and challenges so that we may all learn from each other’s experiences.